Featuring graceful, flowing curves and subtle end-of-arm rolled detailing, the Corsica Sling and Padded Sling collection complement any decor. Designed by Peter Homestead, their simple and refined styling makes them perfect for poolside lounging, hanging out on the patio, or lazing comfortably in your outdoor dining area. All Corsica pieces are built with durability and easy maintenance in mind. 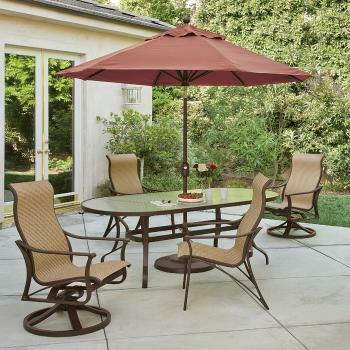 Their lightweight aluminum frames can be powder-coated in any of our colorful, yet durable finishes. Simply hose them off and they’re quick-dry ready. Corsica’s Sling form is offered in a selection of more than 85 different fabrics. For greater selection choose Corsica with Padded sling, offered in 350+ fabulous fabric choices. All designed to weather the sun and rain while offering lasting comfort. Click here to view the full Corsica Sling collection.